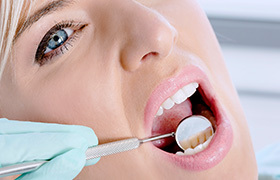 Every patient who comes to see us will undergo a thorough checkup and cleaning, or what we like to call a “dental physical.” We take extra time with these “basic” services because they enable Dr. Cowell and the rest of our team to learn all we can about your dental health as well as how to safeguard it. We’ll examine the muscles in your head and neck, your gums, each tooth, and your jaw using both a visual exam and X-rays as necessary. This typically takes about an hour, and we use all the information we gather to formulate a custom-made treatment plan for every patient. After this, you’ll be scheduled for an appointment with one of our hygienists where they’ll remove all of the plaque and tartar buildup on your teeth to keep your smile nice and safe. Should you require any additional treatments, we’ll take the time to educate you about why and explain the biology of what is going on. That way, you can have all the information you need before deciding to proceed. We recommend having at least two checkups and cleanings each year. With them, we’ll be able to help you avoid the most common dental issues so you can spend less time in the chair and more time simply living your life. Our goal is to give you the kind of smile that requires the least amount of care possible! To schedule your next checkup and cleaning, contact us today.